The redacted statutory declaration (SD) published on various news portals including Malaysiakini was fabricated by a blog named Citizens for Accountable Governance Malaysia (CAGM). The SD claimed an AmBank banker was sacked for trying to report to Bank Negara about large amount of transactions involving an account purportedly owned by the prime minister. The CAGM blog, which posted an unredacted version of the SD this evening, said it is fictitious. However, the commissioner for oaths stamp was genuine, and could have been misused. Prior to publishing CAGM’s SD claim, Malaysiakini had run a check on the commissioner for oaths whose stamp appeared on the SD, which showed the person existed. According to the commissioner for oath’s database, Faridah Abdul Hamid (No. PJS: W420) served as a commissioner of oaths from Jan 1, 2012 to Dec 31, 2014. The SD was dated May 8, 2013. Malaysiakini had also emailed AmBank for response. The CAGM blog also posted what is purportedly a conversation between The Wall Street Journal Asia markets editor Tom Wright and Zainal with regard to the SD. The posted conversation with WSJ appeared to be an attempt to discredit Wright and WSJ in the wake of allegations against Prime Minister Najib Abdul Razak published in the financial daily. 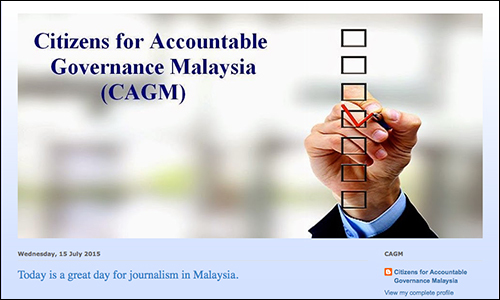 Editor’s note: Malaysiakini has retracted the original article. This entry was posted in Ambank, CAGM fabricated SD and tagged Ambank, CAGM, Malaysiakini. Bookmark the permalink.